Porcelain is a ceramic material created from clay and water. The mixture is molded and then heated at temperature above 2,000 F. Usually in order to create a more realistic skin tone the color is added to porcelain. If there’s no color added and the doll is left un-glazed it is called bisque doll. Bisque dolls are the most expensive and the most exquisite. Porcelain dolls have always been in demand. Some are very rare and collectors have to pay a lot of money to get them. Others are relatively cheap and children love playing with them. But first let’s talk a little about the history of dolls in general and porcelain dolls in particular. Did you know that the oldest doll is about 35,000 years of age? It was found near the Czech town Brno. It was made of the mammoth’s bone and of course is not in any possible way related to porcelain dolls. Unlike in modern times, those ancient dolls weren’t meant for children or as decoration elements, but were used in various occult practices. 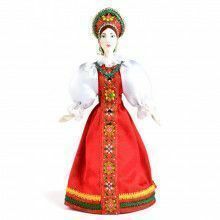 You can find such dolls practically in any corner of the world. There were lots of them in pagan Russia, too. The doll-making industry existed even in ancient Egypt, back in 1800 B.C.! The dolls normally had movable limbs and were decorated with tattoo patterns. Archaeologists have discovered many different dolls in Egyptian tombs, so those toys helped them learn quite a few new things about the culture of ancient Egypt. Later dolls were used in theaters to attract more visitors. Everybody wanted to see large and small moving marionettes, so theaters used their chance to get more audience and more money. Can you imagine how boring our life would be now if we still saw dolls only in theaters? Thankfully, in the XVII century France did a very smart marketing move. Isn’t it amazing that marketing existed that far back in history? The thing is that French fashion designers started sending porcelain dolls worldwide with lots of beautiful clothes, accessories, and even cosmetics. The reason was that France wanted to be considered the fashion leader of the world, so dolls were mainly used as miniature mannequins. When a rich lady got her doll and a whole package of clothes and accessories, she would try them on the doll first and then order her sewing-maids to make the outfits she liked most. At that time kids seldom were allowed to play with those dolls because they were way too expensive. So they were used mainly as fashionable souvenirs. As the demand for porcelain dolls grew, it was only natural that eventually their mass production started. When that happened, their price inevitably went down and gradually more and more people could afford them. That’s when these dolls found their place in children’s hearts. But there still are unique and extremely expensive dolls made for collectors. In fact, the most expensive bisque doll was sold for $200,000. The dolls you can see in our collection are not that expensive. 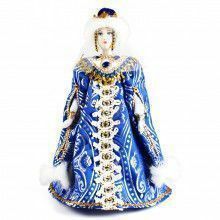 They are very affordable and extremely special to the hearts of those who love Russian culture. 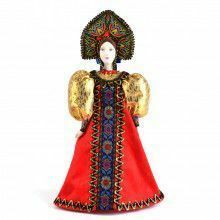 Here you can see , dolls in traditional Russian costumes, princess dolls, dolls representing characters from Russian folklore dolls dressed as duchesses and even empresses! Pictured above is a doll named Alyonushka. 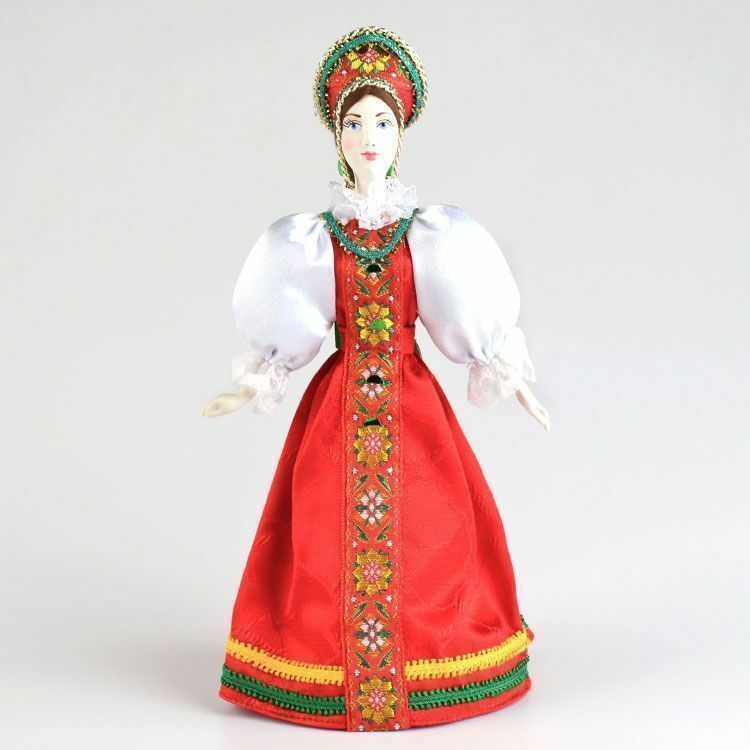 Both her dress and her head piece are carefully modeled after real Russian women’s clothing. Alyonushka is wearing traditional clothes of the Northern Russia. Historians think that Russian costumes appeared back in the 10th-12th centuries. Everybody wore the same type of clothes then, so there was no such notion as fashion. The clothes at that time were not only beautiful, but they were also comfortable to wear, because at that time life wasn’t all about play; in fact, it was mainly about work. Depending on the status and the wealth of the people, fabrics, decorations and accessories were different, but the costume was basically the same. Festive clothes were normally passed down from generation to generation, because nobody thought about fashion and because festive garments were uniquely and richly decorated. They were real works of art! Women’s clothes consisted of a linen shirt called "rubakha." The sleeves and collars of rubakhas were beautifully decorated with silk lace, golden threads, embroidery etc. Then women would put on a sarafan on top of the rubakha. Peasant women in Central and Northern Russia wore sarafans until the XXth century. Upper and middle class women stopped wearing traditional costumes in 1699 when Peter the Great issued a decree forbidding everybody but peasants, priests and monks to wear them. Anybody who entered a city in traditional clothes, as well as men wearing beards, had to pay a fine. Those who didn’t have a horse had to pay less than the richer people who entered a city on a horse. Alyonushka is also wearing a very beautiful head piece called "kokoshnik." You can’t imagine a more Russian headdress. It is known that Russian women wore kokoshniks back in the 10th century! Kokoshniks were a festive type of headdress. Just like festive clothes, they were beautifully decorated and passed down from one generation to another. There were several other types of headdresses that unmarried girls and married women wore. The difference was that married women had to cover their hair completely, and young girls’ headdresses were open in the back to show their hair. In the beginning of the XXth century thanks to the Ballets Russes the Western world saw Russian traditional head piece and many people fell in love with it. You can see a few movie stars wearing kokoshniks in old movies. In 2011 Russian Vogue featured a very beautiful collection and each model in the picture wore a kokoshnik! In the South, instead of the sarafan women normally wore a "poneva" which is a homespun woolen skirt. Only married women could wear it. Young girls normally wore just a rubakha shirt with a belt. Unlike the sarafan, the poneva never really became a universal clothes item. Only peasant women wore it. As for men’s costume, it was mainly composed of a rubakha shirt with a stand-up color called "kosovorotka," pants ("porty"),a belt and bast shoes (later boots). By the way, did you know that in our collection there is also a porcelain figure of Peter the Great who is responsible for the Europenization of the Russian clothing? Where to get a Russian Doll? 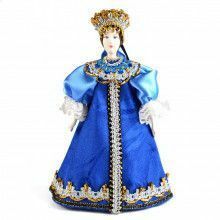 We offer you a rich choice of exquisite dolls with porcelain head and hands, all beautifully painted, with handmade clothes depicting real costumes from different times and cultures! 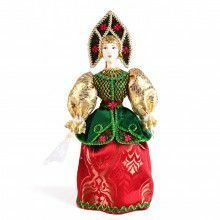 Choose a doll you like and it will surely bring warmth, beauty and sunshine to your home and into your heart. All of our Russian dolls (including nesting dolls) are imported from Russia.